We have all felt it. That craving that just can't be satisfied with anything else. We're talking about chocolate. 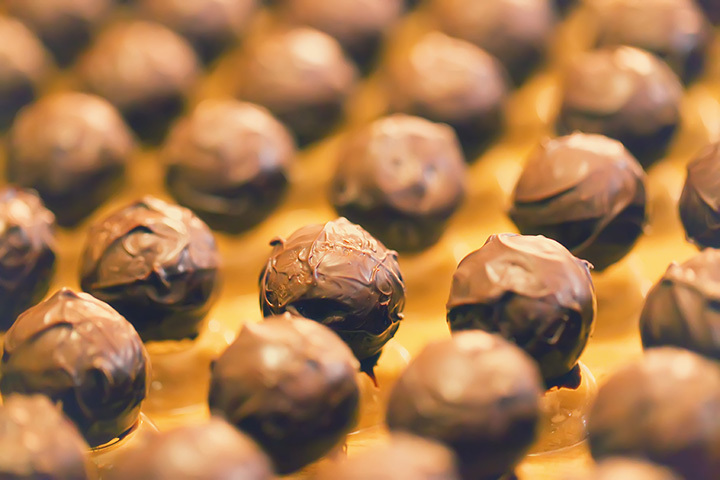 Next time that craving strikes, opt to visit one of Rhode Island amazing chocolate shops. Whether you prefer truffles and turtles or peanut butter cups and brittle, there's an option for every palate. Here are the best in the state. Sweenor's Chocolates is a family-owned chocolate shop operated by third and fourth-generation confectioners. Having been in the sweets business since the early 1900s, Sweenor’s uses only the finest top-quality ingredients, and you will find confectionary treats like peanut brittle, caramels, truffles, turtles, sugar-free options, hard candy, taffy, and more. Established in 1992, Chocolate Delicacy was founded by Dave and Marie Schaller, and their small shop is light, airy and clean. Plus, their small-batch fudge is spot on delicious and features milk and dark chocolate flavors. Moreover, you will find candy novelties, gifts, chocolate baskets, sweet treats, holiday pastries, and more. Established in 1981, Dyane always knew she wanted to be a confectioner, and now her one-stop sweet shop offers baking supplies, delicious wedding cakes, decadent confections, and hand-made chocolates. You can find cakes, cookies, cupcakes, and, of course, plenty of chocolate confectionaries. This company was founded by three sisters who are native Rhode Islanders. A small-batch, local chocolate shop in every way, this 3,000-square-foot store offers some of the most raved about chocolate confectionaries in Rhode Island. And the recently-named "Best Candy Store in Rhode Island" by RI Monthly Magazine offers boxed chocolates, exclusive in-store signature products, and baskets and trays. Featured on WeddingWire, Jennifer’s has been making artisanal hand-crafted chocolates for over 15 years. Using a proprietary technique, this chocolate shop crafts small batches using their own blends of high quality imported and domestic chocolate. You’ll find sweet treats like truffles, peanut butter cups, turtles, chocolate-covered pretzels, brittle, and more. This sweet shop in historic downtown Newport offers the self-proclaimed largest selection of handmade chocolates, cookies, cupcakes, and edible gifts in town and the surrounding areas. With chocolates for every occasion like weddings, showers, graduations, birthdays, and anniversaries, this chocolate shop has been family-owned and operated since 1997. Situated on Block Island, Chapel Sweets offers delicious fudge, nut and chocolate confections, hand-crafted chocolates, and hard candy to fill every sweet tooth. Plus, you can shop online, and Chapel Sweets will ship right to your door. Featuring nostalgic hard candies from times past as well as small-batch artisanal chocolates, Sweet Lorraine’s has penny candies, organic candies, sugar-free candies, and more. Although they do not make chocolates on premises, they do carry some of the best chocolate around, including products from Harbor Sweets, Hauser, Lake Champlain, Ocean State Chocolates, Sweenors, and more. Seriously. How can you go wrong with a name like Newport Fudgery? Fudgemasters hear mix cane sugar, fresh cream, and milk into kettles every morning. Then, they hand-whip the sticky goo with wooden paddles until it is aerated, smooth, and creamy. Finally, nuts, flavorings, and mix-ins are added. The upshot is a fudge that will melt in your mouth, not in the box.